Sant Rampal was arrested in November 2014 after two-week long stand-off between his followers and the police which had left six dead and several others injured. 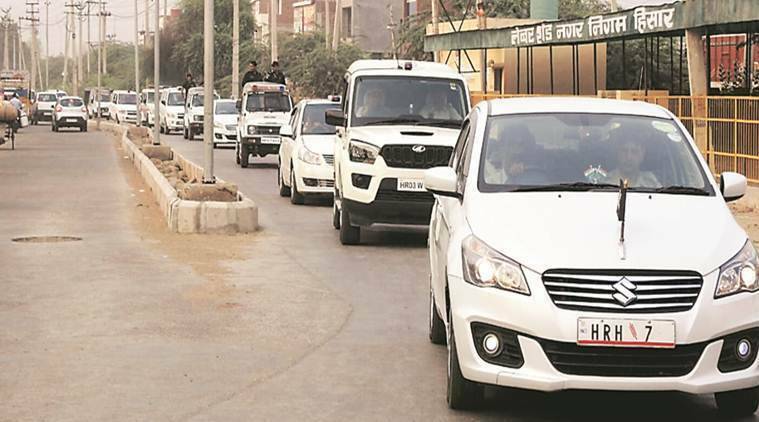 A day ahead of the court verdict in two murder cases against self-styled godman Sant Rampal, the Haryana Police have fortified Hisar with deployment of 1800 policemen and checking of every vehicle entering the town. Rampal, who enjoys a huge following, is currently lodged at Hisar’s Central Jail-2. He was arrested in November 2014 after two-week long stand-off between his followers and the police which had left six dead and several others injured. Hisar SP Shiv Charan Attri said that a special court will be held inside the jail — Hisar’s Central Jail-1 — to pronounce the judgment via video conference on Thursday. “More than 1800 policemen have been deployed in the town. A flag march was also conducted in the town today,” said Attri. The management of Rampal’s Satlok Ashram, however, has made it clear that they have asked their followers not to go to the town on Thursday. Satlok Ashram media in-charge, Chand Rathee, told The Indian Express that police had lodged as many as six FIRs against Rampal and his supporters. “The court has already acquited Sant Rampal in two cases which include charges of taking followers hostage. In another two cases registered in connection with the six deaths, the court would pronounce its verdict on Thursday. Two other cases, including one lodged under the charges of sedition, are still pending in the court,” said Rathee. “We have seen what happened in Panchkula. We don’t want any law and order related problems. Only our lawyers will go to the court tomorrow. We respect the law and would accept whatever is the court verdict,” stressed Rathee. Rampal is founder of the Satlok Ashram which is termed a “socio-cultural movement” by his followers. His religious sect is known as Kabir Panth, and Sant Rampal is referred to by his followers as ‘Jagatguru Rampal Ji’. In 1999, Rampal-led Bandi Chhor Mukti Trust had built an ashram in Karontha village of Rohtak district which later became a cause of controversy between his followers and the Arya Samaj. He courted a major controversy in 2006 after a bloody battle between his followers and Arya Samajis in which one person was killed while 59 others were seriously injured near the ashram. Rampal lived in Karontha ashram till 2006 when the district administration attached those properties. He then moved to the Barwala (Hisar) ashram, and stayed there till his arrest. The ashram was closed after the November 2014 clashes. Sources said that currently, two ashrams of his sect are operational in Bhiwani and Delhi.